While Gov. 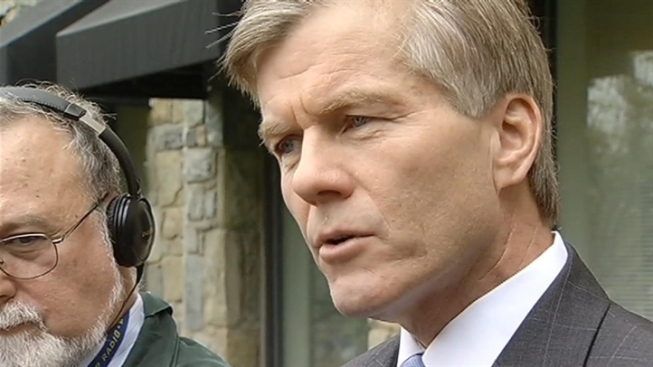 Bob McDonnell says he's busy identifying gifts from a wealthy campaign donor and corporate benefactor for either return or reimbursement, he said Thursday he has no intention of paying legal bills totaling $53,530 and growing that a law firm has billed taxpayers for a review that cleared him of wrongdoing. On his monthly radio appearance Thursday on Richmond-based WRVA, McDonnell said a legal defense fund was set up only to help him pay the team of private attorneys he has hired amid federal and state criminal investigations that are looking at his relationship with Star Scientific Inc. chief executive Jonnie R. Williams Sr.
"I have some friends who were kind enough to set up a legal defense fund and they're doing that on their own and that will help defray some of these costs,'' he said. Bills from the firm of Eckert, Seamans, Cherin and Mellott for a review overseen by former Attorney General Anthony F. Troy are for the governor's office to pay, he said, because the review was begun by Attorney General Ken Cuccinelli. Troy's three-page report cleared McDonnell of violating state ethics law, concluding that neither Williams nor Star Scientific benefited from the gifts to McDonnell and his family. The firm has offices in Richmond. "What happens -- and occasionally this happened when I was attorney general -- is there are conflicts with the governor's office on things or the governor may choose, for whatever reason, to seek his own counsel on certain matters,'' said McDonnell, a Republican. Cuccinelli, the Republican nominee for governor, withdrew his office from the investigation, citing conflicts of interest. Among the conflicts was Cuccinelli's own link to Williams and about $18,000 worth of gifts Cuccinelli reported from him, including vacations, private jet flights and a catered Thanksgiving dinner. Williams' Virginia-based company, a maker of nutritional supplements, lobbied top administration officials to include its anti-inflammatory supplement, Anatabloc, in state employees' health plans, but the requests were denied, according to emails obtained under the Freedom of Information Act. Neither Williams nor any Star Scientific executive or board member has been appointed to state boards or commissions during McDonnell's term. There is no record of the company receiving direct state incentives or tax breaks during that time. Federal authorities, however, are trying to determine whether McDonnell used his authority or the influence of his office to promote Star Scientific or its product. It was the third time in as many days - the fifth in the past 10 days - that McDonnell has publicly discussed the scandal that threatens to wreck his final year in office. He has offered apologies, a plan to return thousands of dollars' worth of gifts that Williams showered on his family, the repayment last month of nearly $125,000 in personal and business loans and the reimbursement to Williams for cash wedding gifts to two of his daughters. McDonnell told reporters Wednesday that both of his daughters had already repaid their nuptial gifts to Williams - a $15,000 check to 28-year-old daughter Cailin before her June 2011 wedding, and $10,000 to 32-year-old Jeanine and her fiance, Adam Zubowsky, before their May wedding in Virginia Beach. But on the radio Thursday, he added that both women had repaid Williams from their own money without financial aid from their father. Unlike Cuccinelli, McDonnell never disclosed his gifts or loans from Williams on his required annual statement of economic interest. Gifts to the McDonnells, including the daughters' wedding checks and a $6,500 Rolex watch inscribed to the "71st Governor of Virginia,'' became public through news reports. McDonnell has defended his decision not to itemize Williams' gifts on his reports on grounds that state law compels the disclosure only of gifts directly to officeholders or candidates, not their kin. Also, under Virginia's porous ethics laws, even direct gifts to the elected officials are exempt from disclosure if they come from close personal friends.